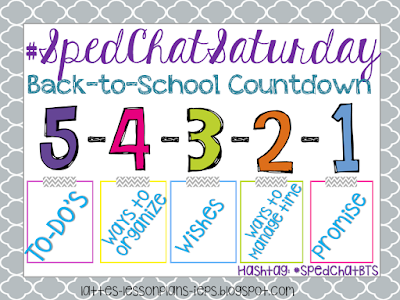 I'm so excited to participate in the first ever #SpedChatSaturday, hosted by Ashley @ Lattes, Lesson Plans, & IEPs. This week's topic is Back-to-School. Are you ready? I am ready to be back to work, but I'm not prepared for school to start. I'm doing my best to enjoy my last few weeks and not get overwhelmed thinking about school! My to-do list is never ending, but here are a few priorities. Make sure to grab my free to do list at the end of this post! 1. The first thing I do every year before I can really start getting ready for school is make a schedule. I create a whole class schedule that shows me where everyone is (students & paras) and what they are doing. 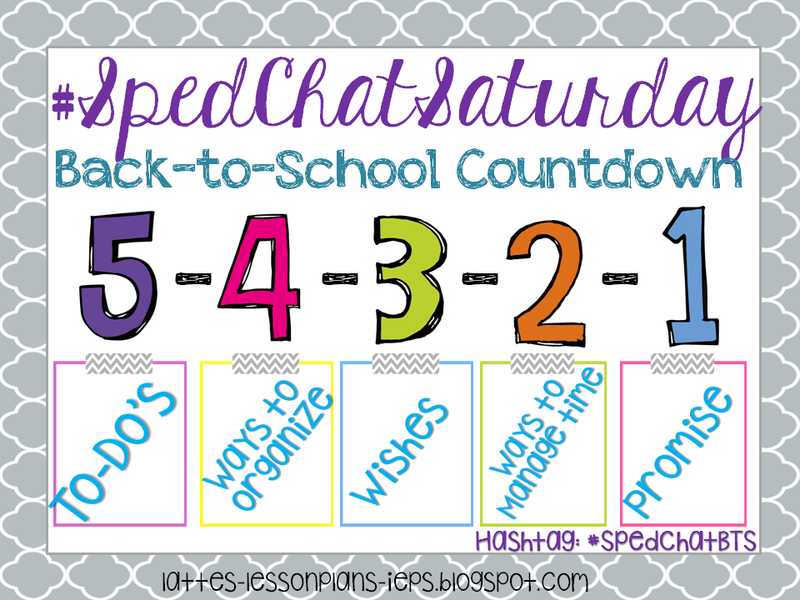 Then from there I can work on individual student schedules, detailed para schedules, toileting schedules, related service schedules, etc. It goes on and on! Here is my whole class schedule from last year. 2. I started this last year and it was so helpful! 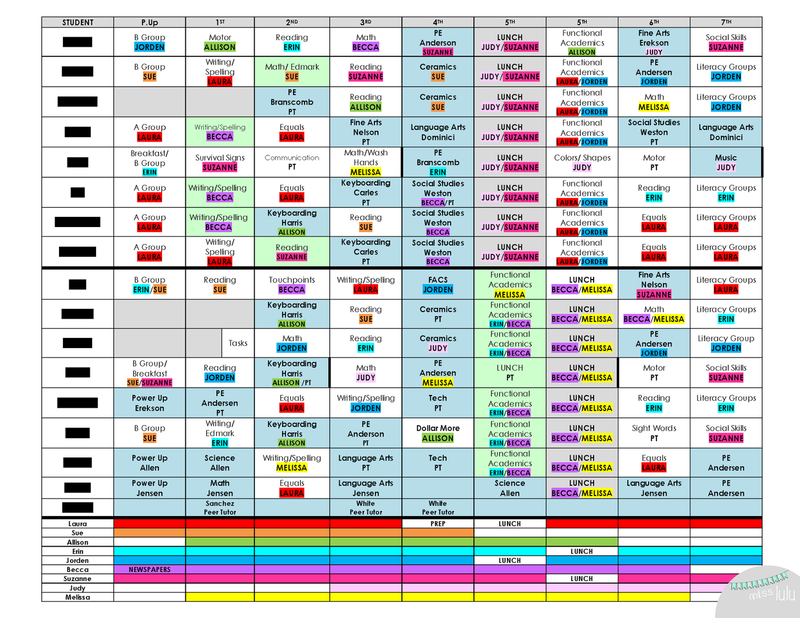 After my schedule is done and I know which programs I will be teaching, I create a yearly curriculum map. It basically tells me what I am teaching, when I am teaching it, and the standard that I am following. 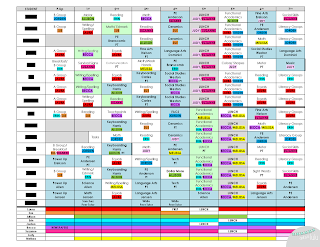 Here is my math curriculum map from last year. 3. 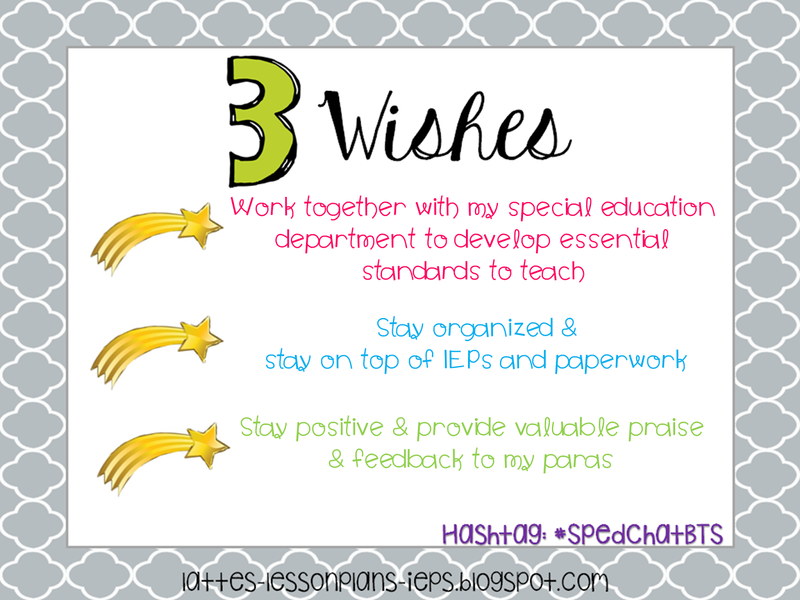 Collaboration with general education teachers is huge for special education and starting before school helps establish positive, open communication from the beginning. Before school starts, I stop by and chat with each of the teachers that have my students in their classes. I give them a list of tips and accommodation ideas and let them know that I am available to help make accommodations or modifications to assignments if needed. 4. 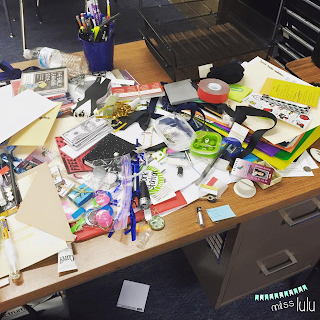 My classroom is very organized. My desk is not. It's my catch all. I always try to get it organized and cleaned up before school starts. It just helps me feel ready each year! 5. I spend tons of time and money on TpT and creating my own products. I've downloaded and created tons of things the last several months that I have not printed yet, so one of my goals before school starts is to get all my files organized and at least printed. Then I have things for my paras to prep when they have downtime. 2. Love using this small parts organizer from Home Depot to organize my picture icons for PECS or schedules. This is my favorite thing in my classroom! 3. My project this summer has been to organize all of my center activities and task cards in labeled file folders. I just stapled the sides so small parts don't get lost. Cheap & easy! 4. I love using these plastic drawers for lesson materials. I store teacher books, student books, or worksheets needed for certain class periods in their own drawer and then I can just pull the drawer out and take it to wherever I am teaching. This year, I created my own customized planner for my day at school, my grad school classes and my TpT business. When I was in college I used a planner religiously. Since then, I have moved away from it but find myself leaving random notes and to do lists everywhere. I wanted to buy a planner, but I also wanted something that I would use, so I decided to create my own. I had it printed and bound at FedEx for less than $30 (100+ pages). It has a weekly schedule and to do list for both work and school, as well as my planning section for TpT. I also have a goal to use my prep time much better this year. I'm lucky to have a class period where all of my students are out of my classroom but it seems like I always have interruptions during this time- either other teachers coming into talk, behavior problems that I have to intervene in, or my need for a coffee run. This year, I plan on going into school an hour early so that I can spend that time in my quiet classroom, all by myself, getting lots done! If you have read any of my previous posts or follow me on Instagram, you know that I have a new baby with special needs. I have decided to work part time this year so that I am available for his medical needs. I promise that this year and every year, I will put my family before my job. I love teaching and I love my students, but I love my son more. And as much as my students need me, my family and my baby have to come first. I know that it will be hard for me to manage my time between school and home. But I promise that I will remember that I chose to work part time because it was what I needed to do and I will make my family my priority. Thanks for stopping by! Make sure to grab some back to school freebies here, here & here and check out the rest of the link ups by clicking on the picture below. 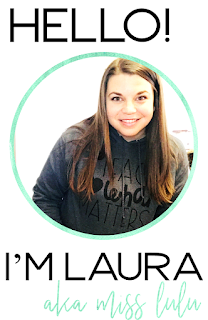 Laura, Wow! Oh my goodness! Your post really has got me thinking about my own planning and how to make it more efficient! 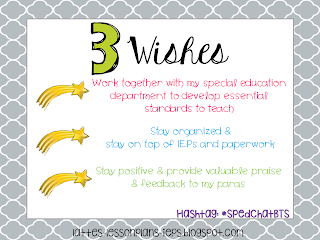 I'd love to lean more about about how you make your own planner for print... Planners are SO necessary for sanity in special ed. I look forward to hearing more about it! Thanks for reading! I will do a post about my planner this week! 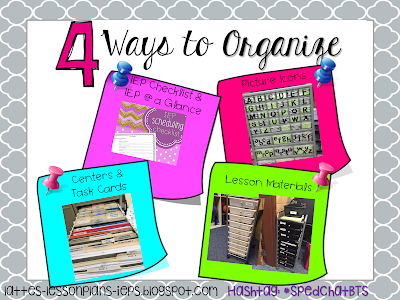 I love how you use the organization boxes in your classroom. That is one area I need to improve upon! And I agree with Emily. I want to know more about printing your own planner! Did you do it online or in the store? I did it online. I'll do a post about it this week! I totally feel you on the prep time interruptions! I get a half hour a day when all my students are out of my room- but it's never enough time! I have to spend it waiting in line at the copy machine, going to the bathroom, covering the other teacher because she has a behavior issue, intervening at specials because my student(s) are acting out, etc. It seems I only every get about 5-10 minutes to actually accomplish something...and then I end up working through lunch to try and catch up. :( It's a vicious cycle. I agree that planners are ESSENTIAL to a special ed. teacher! Love, love, love using them to keep track of things. Like the others, I'd love to hear more about your planner. It's so hard to find something out there for everyone's unique needs.